As the weather becomes colder and we head into winter, I thought now would be the perfect time to share this delicious Coconut Lentil Soup recipe, so you can enjoy it on those cold, wintery nights. Truth be told, I love it so much I often have it year round. 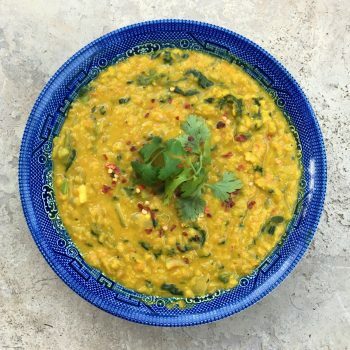 Full of immune-boosting herbs spices (like garlic and turmeric), this recipe was the perfect accompaniment to our ‘Staying Well in Winter‘ article from our May Newsletter. Although this recipe contains a few ingredients, as many of them are spices, it is still relatively quick and easy to prepare. If you make a big enough batch, you can also have it for lunch during the week, or freeze some for later. As I’ve said before, there’s something so deliciously satisfying about red lentils, and I’m a big fan of not having to soak them for hours before cooking. Combined with delicious spices and some rich and creamy coconut milk, this recipe is truly a winner! *If you don’t have fresh chilli, you can also use a pinch or two of dried chilli flakes. **A little sweetness from the coconut/rapadura sugar really helps to bring out the flavours. Heat the coconut oil in a large saucepan. Add the diced brown onion, and sauté over a medium heat for 2-3 minutes. Add the grated ginger and crushed garlic. Stir through the turmeric, cumin, cinnamon, cardamom and chilli, and sauté for another minute, until fragrant (don’t let the spices burn!). Add one cup of the vegetable stock, and stir to loosen any of the spices that are sticking to the pan. Add the remaining stock, lentils, grated sweet potato and one tin of coconut milk. Cover and bring to a boil. Once boiling, reduce heat to low-medium and simmer for 20-30 minutes, until the lentils have softened. Make sure to stir occasionally so the mixture doesn’t burn or stick to the bottom of the saucepan. Add the remaining tin of coconut milk, lime juice and sugar, and cooked for another 5 minutes or so. Before serving, stir through the baby spinach and half of the chopped coriander, until wilted. Add salt and pepper to taste. Spoon into bowls and served topped with freshly chopped coriander. Note: This recipe makes a really thick and hearty soup. If you prefer a thinner soup, simply add in 1-2 cups extra coconut milk, vegetable stock, water, or a combination of these. This recipe is also really delicious with 1-2 stalks of fresh lemongrass. Simply slice off the bottom and the top leaves, and peel off any dried outer layers. Using the side of the knife, bruise the bottom 2-3 inches of the stalk. Then, finely chop the bruised stalk and add it along with the ginger at the start of cooking. For a stronger flavour, grind the lemongrass with a mortar and pestle after chopping.